Colombia 262-167 (Colombia – http://clerk.house.gov/evs/2011/roll781.xml). To review the Senate roll call votes online, go to: http://www.senate.gov/legislative/LIS/roll_call_lists/ and follow the directions. The AFL-CIO has declared the ten days following Thanksgiving (November 25 through December 4, 2011) as “Buy Union Week.” The action adopted by the AFL-CIO’s 25th Constitutional Convention also urges affiliated unions to use “all available means” to promote the purchase of union made gifts during the upcoming Holiday season. Given the volatile state of the economy—marked by huge job losses, declines in take-home pay and increased costs—it makes more sense than ever to focus the purchasing power of union families on the goods and services that those families create. Supporting union made products helps keep good jobs in the community. Consumer surveys indicate that Holiday spending will largely remain flat this year and that most of us will pay cash rather than add to our credit card debt. Still, the National Retail Foundation says that Americans will spend on average $704.18 on Holiday gifts and seasonal merchandise this year. All the more reason to specify “union-made-in-the-USA” gifts for friends and family—we’ll be looking for practical, quality gifts. Fads and gadgets won’t be big sellers this year. Visit www.unionlabel.org and click “Find Union Made Products and Services” in the yellow box at the top of the page to find ideas to start your shopping list. Demand union made products and services when you shop. When you wrap your presents, use the enclosed tag to let friends and family know you shopped union. If you just can’t find a union source for the gifts you want to give, why not just give cash, and ask the recipient to spend it on union products or services. 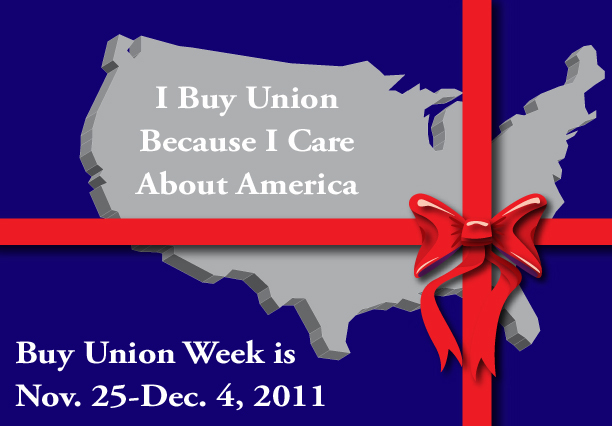 Please contact us with your ideas for making “Buy Union Week” a big national success. Economists will tell you it takes two elements to create a marketplace: supply and demand. Producers create the supply; consumers provide the demand. The phrase isn’t “supply and suggest or request” it’s “supply and demand.” Demand implies firmness, authority or power. When we complain that we can’t find union-made goods to buy, we’re saying that the marketplace is failing us. We’re bringing the demand, but producers aren’t giving us the supply. Polls tell us that union members and their families prefer to support the products and services of union members. That doesn’t mean that every union member would buy union-made if they had the choice, but many would. There are 16 million union members in the U.S. Let’s assume that every union member “influences” buying decisions of just three other people, on average: that might mean folks in their immediate family (spouses, children, mothers, fathers, aunts and uncles) or room mates, neighbors and friends. The average weekly wage for union members is $967, or $50,284 a year. 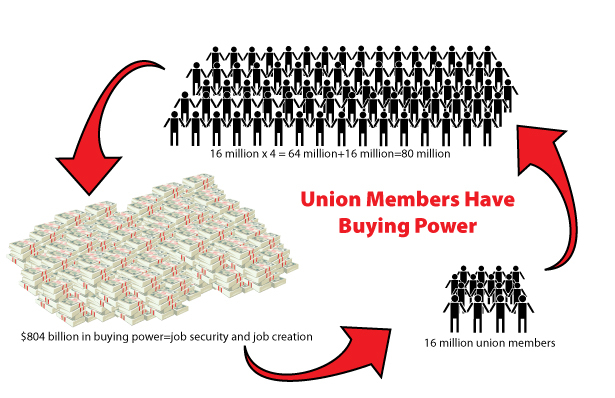 There are 16 million union members in America X 4 (the number of people who are influenced, plus the union member = 64 million. $50,284 X 16 million= $804,442,000,000—more than $804 billion! If you laid 804 billion single dollar bills end to end, the line would stretch for 750,000 miles, or more than three times around the world. That’s a long way! Just imagine how far that line would take us if we used it as buying power. So, we have a marketplace of 64 million people, with more than $804 billion to spend and they want to spend it on union-made goods and services, but all they see are autos made in Asia, clothing, appliances, electronics, tools made in China. Even worse is what our union buyers don’t and can’t see—billions of dollars worth of goods with parts and components from somewhere else. Most of the little gizmos inside your computers and cell phones are made in China. The tiny parts under the hood of your car are most likely from foreign sources. The ingredients for many prescription drugs are mixed in bulk in places like Asia and China. Do you like frozen shrimp? Catfish? Did you know that many of the frozen seafood products you see in your supermarket were raised “ranch style” in ponds in Asia. When something goes wrong with a foreign-made product, you might get on the phone (or the internet) and try to find out how to fix it. If you end up talking to a live person, most likely, it will be someone in India who says their name is “Judy” or “George”. Nowadays, the folks who read your x-rays if you’re sick, are somewhere else. Your banking and credit card transactions are recorded and maintained half a world away. Okay, so the stuff you buy isn’t made union, and it’s not made here, and it’s not repaired here. So, how do you fix all that? The average daily union wage is $193.40. 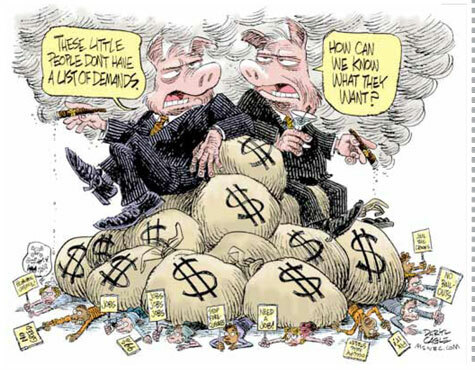 Now, we understand that you don’t “control” every dollar of that daily wage. A lot of it is gone before you even get your check. One-third of it (say $63) is already earmarked for housing or rent; another 10 percent or so goes to taxes ($20); another $70 pays for insurance, medicine and groceries. But, that still leaves around $40 per day in “discretionary” spending—money you choose to spend on a daily basis. Maybe some of it goes for chewing gum, tobacco, refreshments, entertainment, a decent lunch, a kid’s haircut, clothes and shoes. “I’d love to buy something here, but I just can’t find any of the products I need on your shelves that carry a union label. I can’t even find anything that’s made in America. “If I’m wrong, would you consider setting up a display of union-made or American-made products? Suppose, just suppose, that everyone in your local union—maybe 500 people—decided that for just one day you’re not buying anything. No food, no gasoline, no coffee, no lottery tickets, nothing! Assuming you and everybody else in the local have $40 you could spend today—that’s $2,000 that won’t go into the local economy. There’s just one other thing: you’re going to have to announce it. And, maybe you should try to enlist some allies—from other unions, in your church, at the American Legion, or wherever groups get together who aren’t going to spend anything that day either. Remember the $804 billion. That’s power.